LAS VEGAS – Chevrolet provided the first look at nine high-performance concept cars today at the SEMA Show. The horsepower-infused range includes stylized versions the all-new 2014 Corvette Stingray, SS sports sedan and a variety of restyled 2014 Camaros – including the all-new Z/28. "From the all-new Corvette Stingray to the new Camaro Z/28 and SS performance sedan, Chevrolet is America's choice for performance cars. Our new lineup of racing-influenced models gives customers more choices for exciting driving experiences," said Chris Perry, vice president of Chevrolet marketing. "It's our most diverse range of performance-car choices in nearly 20 years." Through the end of September, Camaro's total sales lead over Mustang was more than 5,000 for the year, putting it on track to be the industry's best-selling sports car under $50,000 for the fourth consecutive year. The Camaro enters 2014 with revised styling and the new Z/28 model – the most track-capable Camaro in the car's history. The all-new SS returns Chevrolet to its rear-wheel-drive performance sedan roots, established with the small-block V-8 in the 1950s and enhanced with the Impala SS in the early 1960s. And Chevrolet dealers can hardly keep the all-new Corvette Stingray in stock, with sold orders rolling to new owners off transporters. "Racing is the common thread among Chevrolet's performance cars and that comes from decades of transferring race technology to our production models," said Jim Campbell, GM U.S. vice president of Performance Vehicles and Motorsports. "Corvette, Camaro and SS deliver well-balanced, exhilarating driving experiences forged on the racetrack and refined for the street." Many of the concepts unveiled at the SEMA Show have roots at the racetrack. Others show racing-influenced styling for the street. Most incorporate Chevrolet Accessories available from Chevrolet dealers, allowing customers to personalize their new performance car with factory-engineered and validated components that match the performance and quality of original equipment. Also on display was a 2014 COPO Camaro – Chevrolet's factory-built race car, designed for NHRA's Stock Eliminator and Super Stock drag racing classes. As with the previous two model years, only 69 COPO models will be built. Racers interested in purchasing one must sign up for the COPO mailing list at chevrolet.com. With input from the No. 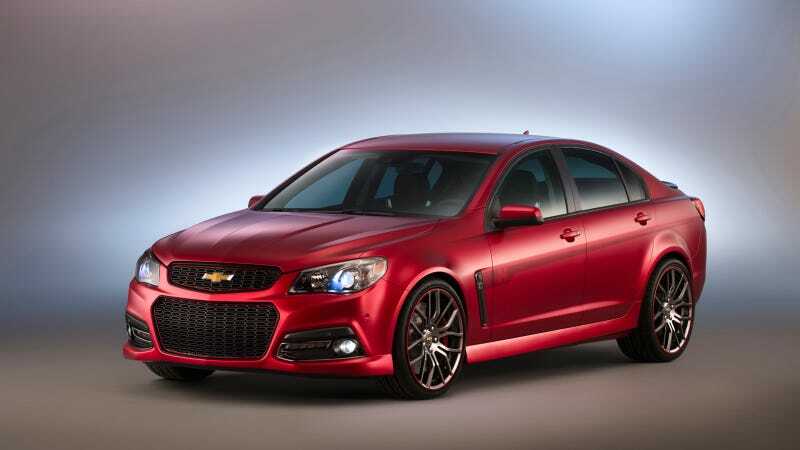 24 driver himself, Chevrolet designers restyled the all-new SS to reflect Gordon's style and the performance credentials of the brand's all-new, rear-wheel-drive performance sedan. A satin exterior finish lends an all-business appearance to the car, complemented with No. 24 graphics, custom-finished 20-inch wheels, a carbon fiber rear spoiler and a custom front grille. The car casts a more aggressive stance with a lowered suspension. The Gordon SS concept features high-performance brakes and a Borla performance exhaust system. The interior is re-trimmed with perforated suede seat inserts and embroidered headrests and a racing-style flat-bottom steering wheel and Chevrolet Accessories pedal kit. Under the hood beats the small-block heart of all SS production models: The LS3 6.2L V-8 rated at 415 horsepower and 415 lb-ft of torque. It is backed by a six-speed automatic transmission with TAPShift. Leather-wrapped safety belt bar and rear braces. Like all 2014 Corvette Stingray models, the Gran Turismo® concept is powered by the new LT1 6.2L V-8, which uses direct injection, Active Fuel Management and continuously variable valve timing to produce 460 horsepower and 465 lb-ft of torque (with the available performance exhaust) – enabling EPA-estimated 29 mpg on the highway. The concept vehicle is also equipped with the standard seven-speed manual transmission. One of a pair of right- and left-coast-themed concepts, this Blade Silver Convertible model represents the Atlantic side, with sophisticated styling enhancements resembling the details and refinement of a private jet. The exterior wears new Carbon Flash Metallic front splitter, rocker extensions and rear lower diffuser, along with Fusion Gray headlamp housings and hood accents. It is trimmed with a sueded-wrapped interior package. Embroidered center armrest with the Stingray logo. For effortless driving and performance, the Atlantic concept features an LT1 engine with a six-speed automatic. Influenced by West Coast culture, here racing-influenced performance and appearance matter this track-inspired Torch Red Corvette Stingray Z51 Coupe's design is purposeful and compelling. The high-performance hue is complemented by a carbon fiber hood and a visible carbon-fiber weave on the removable roof panel, as well as a satin-black front splitter and rocker extensions. The Z51 rear spoiler is painted Carbon Flash Metallic with a Carbon Flash graphics package. The interior features a carbon fiber trim kit, along with the available Competition Sport seats and a flat-bottom steering wheel with a carbon fiber finish. Because it's a Corvette Stingray Z51, the LT1 engine features a dry-sump oiling system, the cooling and brake systems are enhanced and the transaxle features an electronic limited-slip differential. Even the gearing in the seven-speed manual transmission is unique. Like the Atlantic concept, the left-coast Corvette concept wears a number of Chevrolet Accessories, including distinctive satin black aluminum wheels with a red accent stripe (19 x 8.5-inch in front/20 x 10-inch in the rear). Chevrolet Performance's COPO Camaro program returns for 2014 with another limited run of factory-produced race cars and a pair of new racing engine choices. The COPO exclusives will carry the distinctive, updated styling of the 2014 Camaro lineup, including new front and rear fascias. Each COPO Camaro race car is built by hand starting with hardware from the Oshawa, Ontario assembly plant that manufactures regular-production Camaros. Each production car is fitted with an NHRA-approved roll cage and other safety equipment, along with racing chassis and suspension components – including a unique solid rear axle system in place of a regular-production Camaro's independent rear axle. The new LS-based racing engines include a revised version of the naturally aspirated 427 engine and supercharged version of the 350 engine introduced in 2013. It will feature a 2.9L Whipple screw-type compressor. Naturally aspirated 350 and 396 engines are also available. The car displayed at the SEMA Show features the supercharged 350. Serial number 1 of the limited-production 2014 run will be auctioned by Chevrolet Performance at Barrett-Jackson's annual January event in Scottsdale, Ariz. Proceeds will benefit the Achilles Freedom Team of Wounded Veterans, an organization dedicated to helping wounded veterans participate in marathons and share their success within a supportive community and their families. There was no need to modify the all-new 2014 Camaro Z/28 for the SEMA Show – it's already a comprehensively engineered car that recently lapped Germany's challenging Nürburgring road course in 7:37.40 – on wet track conditions. It was four seconds faster than the Camaro ZL1, and beats published times for the Porsche 911 Carrera S and the Lamborghini Murcielago LP640. The heart of the Z/28 is the 7.0L LS7 engine. The LS7 uses lightweight, racing-proven, high-performance components, such as titanium intake valves and connecting rods, CNC-ported aluminum cylinder heads and a forged-steel crankshaft to help produce an SAE-certified 505 horsepower and 481 lb-ft of torque. Air-conditioning is available, but only as an option. The Z/28 goes on sale next spring. Serious performance enthusiasts will appreciate the combination of Chevrolet Performance parts and Chevrolet Accessories used to create the Garage Camaro concept, which is based on the production Camaro SS. It's a track-oriented car, incorporating performance and suspension components from the all-new Z/28 – and a few from the ZL1. The exterior is enhanced with a ground effects package, Chevrolet Accessories rear spoiler and grille, RS headlamps and taillamps, blacked-out mirrors and rear diffuser, and Chevrolet Accessories satin-black 10-spoke Track Pack wheels. "Chevrolet Performance" graphics adorn the rockers and windshield header. Racing-derived DSSV® (Dynamic Suspensions Spool Valve) dampers. 20-inch black wheels (45th anniversary design). The car also wears Z/28 rear upper control arms, which are being evaluated for the Chevrolet Performance catalog. Chevrolet Accessories floor mats (black with silver Camaro logo).